Thailand is a land of many beautiful temples, an elephant sanctuary, mountains in the north and tropical beaches in the south. The Thai people are very hospitable and welcoming and want visitors to relax and take it easy. Wat Arun Ratchawararam - "The Temple of Dawn"
"The Temple of Dawn" is one of Bangkok's historic landmarks. Long boats are used as part of the water taxi system in Bangkok to move people around on the river and canals. 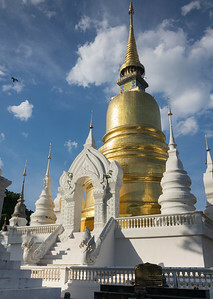 Bangkok, which is the capital of Thailand relies on its network of canals for local transportation and the Chao Phraya River for moving goods up and down the river. 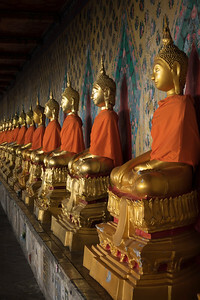 Row of gold sitting buddhas is found at Wat Arun - "The Temple of Dawn" located in Bangkok, Thailand. "The Holy Buddha irradiates the wonderful energies of Healing, Luck, Abundance and Happiness." 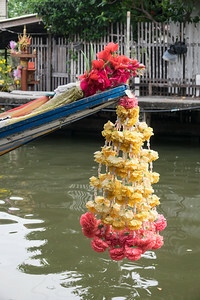 Many of the long boats in Bangkok, Thailand keep fresh flowers on their boats for safe travels, good wishes and good luck. 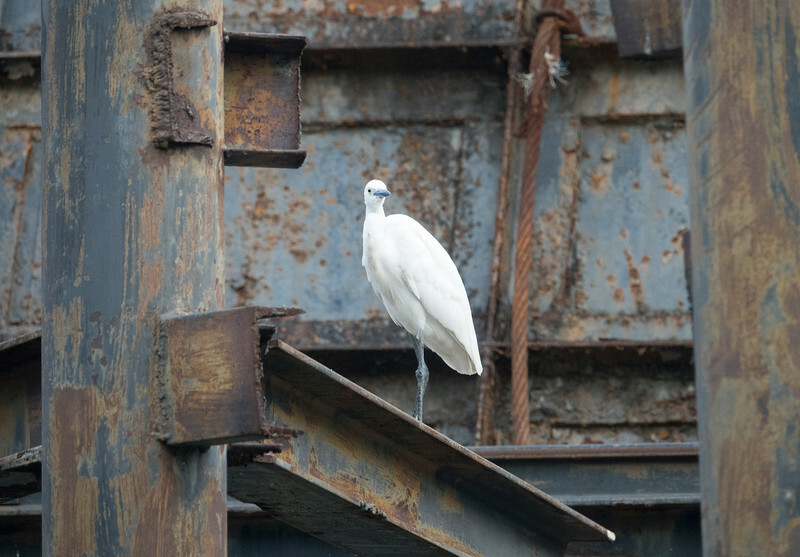 Bangkok in Thailand is also known as the "Venice of the East" largely due to the klongs (or canals) which used to be the main form of transport to getting around. 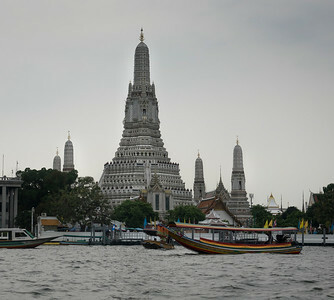 Wat Arun or also called "The Temple of Dawn" is one of Bangkok's historic landmarks. All of it's walls are embellished with intricate carvings and decorative bas-reliefs which are a sight to see! 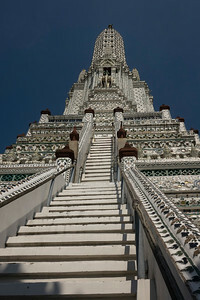 Towering Wat Arun - "Temple of Dawn"
There are many steps to climb to get to the different levels of Wat Arun temple. Once you are higher up the views of the city are worth the climb. 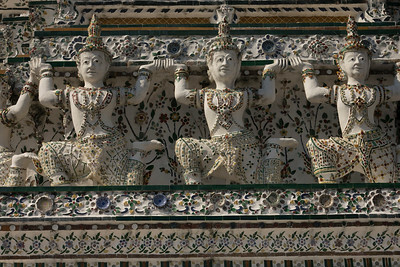 There are many buildings, temples and pagodas to see on the grounds of the Grand Palace in Bangkok, Thailand. 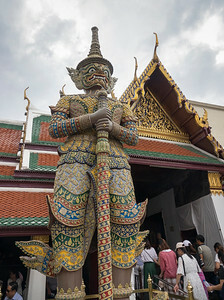 This tall statue was part of a pair of giant embellished figures guarding the entrance to this building. The mask and head gear all had special meanings of the time period represented. 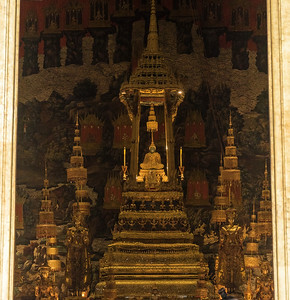 Owned currently by the King of Thailand, the Emerald Buddha is world renowned for being made entirely of the jade emerald stone. 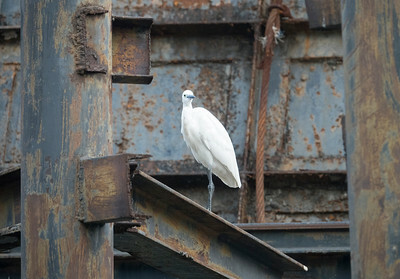 It's size is small compared to its history. This Buddha can be found when visiting Bangkok's Grand Palace grounds, which are open every day for tourists and visitors. 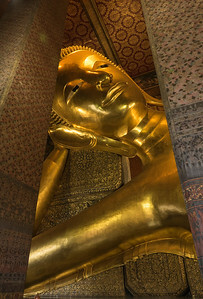 The Reclining Buddha is colossal in size and is astounding to see. Located at Wat Pho, the most extensive temple in Bangkok, Thailand. 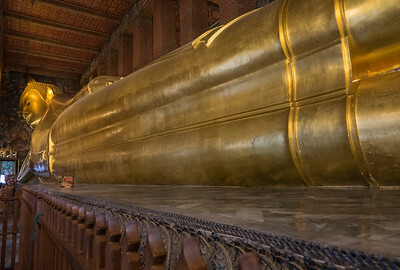 Not only is the head of the Reclining Buddha enormous, but the legs and the feet of the Buddha span an entire length of the building that it is housed in. Located at Wat Pho Temple in Bangkok, Thailand it is an impressive site to behold! On the way up the mountain to visit Wat Phra Temple in Thailand, the people gather to listen to the monks and receive a blessing. 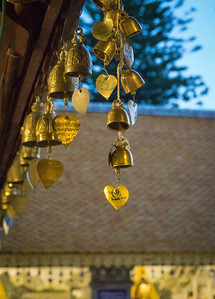 There is an area for ceremonies and an area of symbolic cemeteries of stupas and pagodas. There are two major waterfalls on the nature walk through the Cloud Forest of the tallest mountain in Thailand (Doi Inthanon). 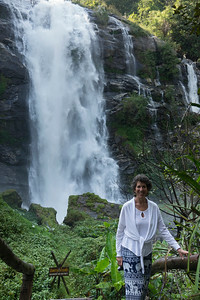 One can walk down a path and get close enough to be sprayed by Wachirathan Waterfall. 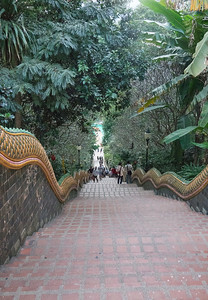 The magical mountain temple of Wat Phra takes many steps to reach the first level of the temple.. Fortunately, they have installed an escalator nearby to be able to reach the first level and the monk's blessings. 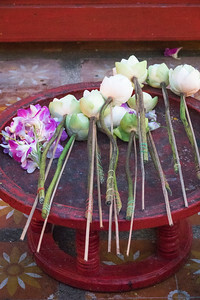 Many visitors once they walk around the top level of Wat Phra Temple leave flowers, candles or burn incense after receiving a blessing from one of the monks at the temple. 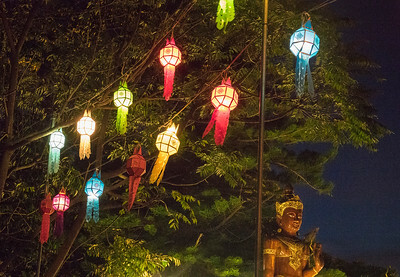 Lanterns light up the night sky at Wat Phra Temple. The view of the city of Chiang Mai is spectacular at night. 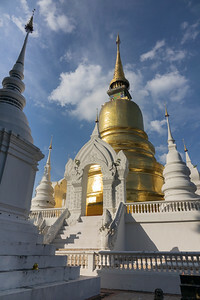 A drive up a tall mountain 10 kilometers from Chiang Mai is the most magical mountain temple approx. 1600 meters above the city. 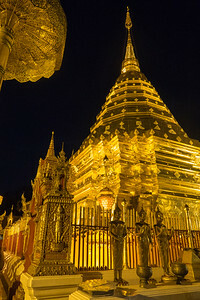 Wat Phra is a famous landmark and considered to be one of the most important temples and most visited in Thailand. It is stunning to see at night! 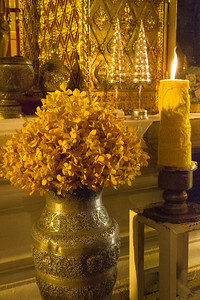 There are many places to light incense and candles while visiting Wat Phra temple in Thailand. 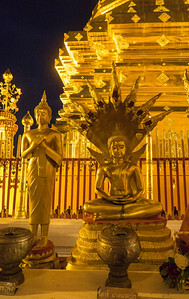 Wat Phra Temple has 306 steps to get to the first level for a monks blessing. While driving to Wat Phra temple there are 87 turns up the mountain before arriving. There are so many visitors that they installed an escalator for those who could not walk up the steps. Ganesh is the remover of obstacles. 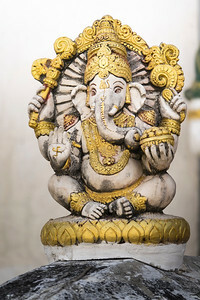 The Ganesh statue can be seen by visitors at many entrances to temples in Thailand. 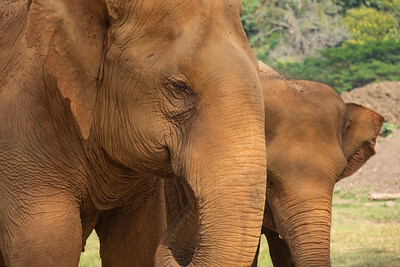 A mother and it's baby that she is watching over at the Elephant Sanctuary located a couple of hours outside of Chiang Mai. 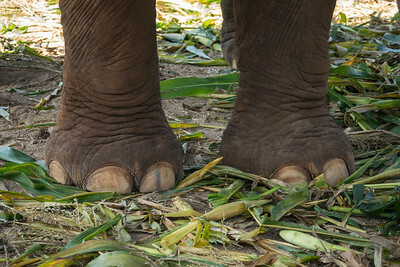 Every elephant has their own personal trainer to help them heal from the past abuse that has been inflicted upon them. They now have a safe home. 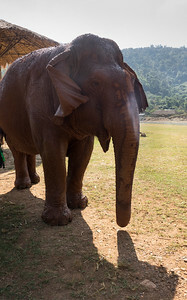 Dirt and mud act as a sunscreen and a bug deterrent and is a daily routine for all of the elephants at the Elephant Sanctuary. 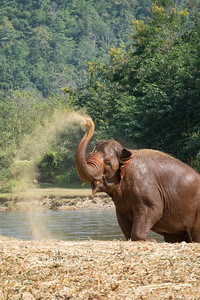 They have a large river running through the Sanctuary and is a definite blessing for all of the elephants. 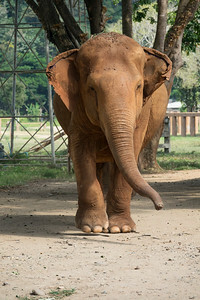 This elephant is living it's life out in peace at the Elephant Sanctuary hours outside of Chiang Mai, Thailand. 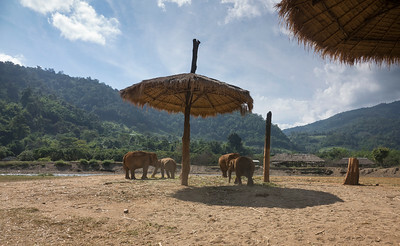 There are straw umbrellas for shade, a river for bathing and cooling off and the cool breeze coming from the mountains which surround the Elephant Sanctuary. 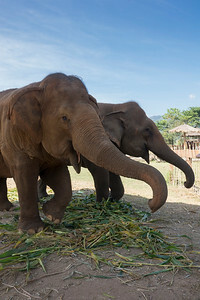 Some elephants you can be close to and others you need to know when to move!